The Wild continues to re-sign cogs in its lineup, today locking up a tough winger with ton of character. Minnesota has re-signed Matt Kassian to a two-year contract. The 25 year old is the type of player that any team in the NHL would like to have in the locker room, but the Wild made sure to retain his services and Kassian is glad to be a part of the organization’s future. The Edmonton Alberta native was on the Wells Fargo Minnesota Wild Road Tour at the Summer Bash when he received the news. Visiting the southern part of the state reaffirmed that he wanted to continue playing for the Wild. 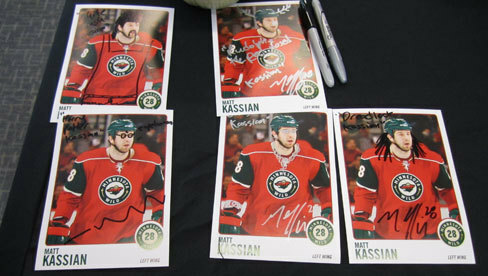 With the Wild last season, Kassian scored two goals, both on March 1 against the Montreal Canadians. He also racked up 55 penalty minutes. He was recalled from the Houston Aeros, the Wild’s American Hockey League affiliate, in late December and never looked back. He skated in 24 games with Minnesota. The 6-foot-4 and 232 pound winger is a force anytime he’s on the ice. He is willing to play a physical game and doesn’t hesitate to stick up for teammates, a vital piece of the Wild’s lineup. The style in which Kassian uses to be effective, wasn’t something that needed to be discussed. “It’s known on both sides,” Kassian said about his game. “They know what I need to do and I know what I need to do. While in Houston last season, Kassian played in 26 games, racking up 2 goals, 2 assists and 34 penalty minutes. After being recalled to Minnesota, he was a staple in the lineup until a sports hernia sidelined him in late March. However, it wasn’t an injury that would keep him on the shelf for very long. “It wasn’t anything that was long-term injury,” Kassain said. He added that he was back to training at full speed about a week after the season. The Wild’s second round (57th overall) pick in the 2005 NHL Entry Draft has played in 28 career NHL games. He made his debut against the Calgary Flames on Nov. 15 of the 2010-11 season. Kassian joins Chad Rau and Stephane Veilleux as forwards to re-up with Minnesota this week. More than anything, the hulking forward is looking ahead to the start of the 2012-13 season in a Wild sweater.